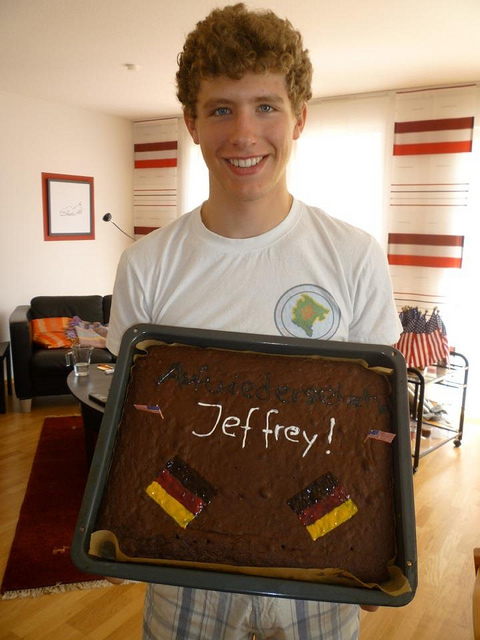 Jeffrey holding a ‘goodbye’ cake at the end of his exchange program. During a life-changing year spent in Aachen, Germany, Jeffrey Bierman embraced the many opportunities he encountered. "I just looked for a year to experience change, to learn the language, to make some solid relationships that would stay with me forever, and to teach me the cultural beauty that comes with diversity." The young man from Oregon set out on his adventure as a Congress-Bundestag Youth Exchange scholarship recipient in the summer of 2011, not certain what changes lay ahead but ready to take on the challenge. The exchange year brought Jeffrey many opportunities for growth even though he arrived unable to speak German at first. "I have grown more than I could have ever imagined, and have learned things that couldn't have been taught in a classroom. Becoming friends with the kids here showed me just how devoted and meaningful a friendship could be after only one year's time. I learned that even small differences in culture can be very noticeable!" One of the small differences that gave him a window into the culture is the approach to punctuality: in Germany, sometimes being on time actually means that one should arrive five minutes early! Jeffrey has used his innate openness to enhance his learning. "I have always tried to be understanding of the way others do things. As an American, I know the way that we express our national pride, and it is a part of our culture that almost everyone takes part in. In Germany it is a very different theme, and at first I couldn't quite understand why. Throughout this year I have discovered why that is. By observing, and sometimes asking, now I understand such a difference." Participants in the scholarship program are expected not only to absorb the language and culture of Germany; they are also expected to be ambassadors of American culture and represent the best of their home country. Jeffrey felt that he was able to show his new schoolmates that "someone different isn't necessarily one to be seen as an outsider. I walked into my school not knowing anyone, and not knowing the language. I started talking to people, and slowly they noticed that the American really wasn't that bad. I think that is important, because not only was I accepting their culture, but they were accepting mine. I am just happy to say that my friends will have a good outlook on America." Jeffery gained a new understanding and new purpose for his role in the community. "Now, I feel that I have something else to offer beyond the ordinary. When I arrive home, I don't want to unpack a suitcase of typical German souvenirs, what I want can't even fit in a suitcase. I want to bring back the stories, and the experiences from Germany, and my positive feelings for the people here too. I want to tell them things from a first person perspective, bridging the gap between our separate worlds."